I wasn’t someone who prayed five times a day until only quite recently and even now, I sometimes manage to miss one here and there. However, I was and am adamant that prayer will be given its due importance, not only for myself, but to set a good example to my son. Especially now that it is my responsibility to make him the best Muslim he can be before he is an adult and responsible for his own actions. When I had Baby Z, I would imagine how praying namaz whilst being a mother would work out. I had planned out that when he was a teeny tiny human, I would lay him adjacent to my prayer mat so I could keep a close eye on him. And that is exactly what I did. Until he began to roll, sit up, and even crawl. When he was at the sitting up stage, I would prop him up on the bed, surrounded by cushions. He would watch and gurgle at me as I prayed. When he began to crawl and stand, I put him in his cot beside me whilst I prayed, to ensure he wouldn’t run into any trouble. When he began walking, I would still coax him into the cot along with plenty of entertainment and nursery rhymes on my phone to keep him occupied. Once he was able to run off and play independently, I would place toys beside me to keep him occupied. Throughout all this, I would always be watching him, just in case. Just in case he tipped over and fell on his face, or he choked on one of the toys I’d given him. Of course it was absurd because I would only give him toys that were of no potential choking hazard…but still I would watch him by the corner of my eye, just in case. The role of motherhood is very difficult, if not impossible, to switch off inside our brains. I struggled with this a lot during prayer and I never struggled more than whilst I was on Umrah. Though we had taken a walking talking toddler with us, for the first two days he was afraid, and my motherly instincts told me to protect him and to calm him. Even though I had travelled to Saudi Arabia to be a better Muslim and concentrate fully on improving my Imaan and relationship with God, there I was shushing my baby boy whilst everyone around me was praying their namaz. I felt as if I had let down God because I was in a constant battle within my self, between my role as a Mother and my role as a Muslimah. Here I was in the Prophet’s Mosque, one of the most sacred places on the planet, and the mother in me wished to run back in to the hotel and pray in peace with a happy child beside me. Suddenly, I realised the importance of one of God’s commands. Allah gives the liberty for women to pray in the comfort of their own homes whereas making it compulsory for men to offer their daily prayers in the masjid. This truly is a blessing for women, to give them the choice of praying at home or in the mosque, and only after becoming a mother do I understand how God was being so accommodating towards women in this respect. On the third day, my husband took Baby Z to pray with him in the hopes that he may be calmer. It was Jummah. Friday prayers, the most special time of prayer within a week. I was alone, and all I did was pray, with full and complete attention. It felt so good and I felt almost rejuvenated. Of course, once the prayer was complete, I could tell as soon as I saw my husband’s face that Baby Z had not let him pray, but Alhumdulillah from the next prayer on wards Baby Z was a lot calmer. Me and my husband took it in turns to have him during prayer time so that we could at least be able to experience some of the divinity of praying alone in such a blessed place as Madinah and Makkah. Though some days were trickier than others, on the whole Baby Z would sit beside me as I prayed, with the help of bribery and entertainment. However, even though he was rather well behaved, I was still aware of him in my periphery always. I would even catch myself giving him a quick glance if I couldn’t see him for half a second, and soon after regretting that I had taken my attention away from God. I understand of course that this was one of His ways of testing my faith, and boy was I failing horribly. I almost felt as if I would be able to give much more attention to my faith if I was in the comfort of my own home, knowing that Baby Z would come to no harm, and I could pray for as long as I wished and with complete attention solely on pleasing God. Being a parent has made me realise the true extent of the sacrifice made by Hajra A.S. and Ibrahim A.S. for their sons and I would pray that Allah grant me with at least an inch of their courage in creating the right balance between taking care of my child and practicing my religion. 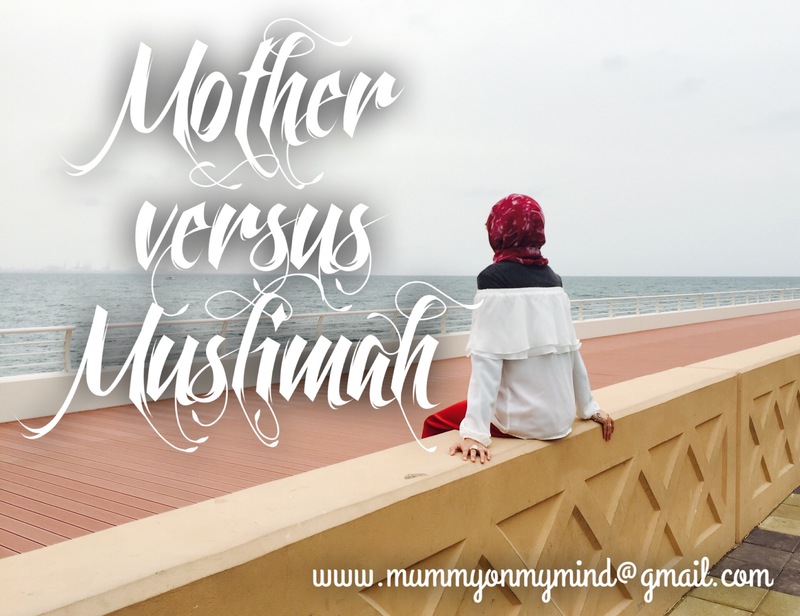 The constant battle between me as a Mother and me as Muslimah roared on for the rest of the time that we were there. Thankfully, when we got back from Umrah, things suddenly began to click. Having taken Baby Z to Umrah meant that he developed a greater understanding of prayer, at least in the physical sense, and began mimicking me when I prayed. I recently wrote about this in my post about catching my son applying makeup. I found myself no longer fighting the battle between being a mother and a Muslimah, as my son joined me in my prayers and I could put aside those 5 times in the day to solely reflect on God and my religion. I am no longer glancing over my shoulder in fear of Baby Z getting hurt whilst mid-sujood and it feels so good to have regained my sanity for this case. Alhumdulillah. Perhaps there is no battle between the Mother and Muslimah in me, and they can in fact flourish along side each other. Have you been in a similar position as me in terms of religion and motherhood? Please feel free to share your thoughts in the comments section below. Being a mother is never easy but I believe that God is pleased by the wives and mothers when they are able to bring the family to prayer, a step closer to God. In the church during mass celebration, we used to sit at the child and babies room, you can’t imagine how chaotic and noisy it was and I could hardly concentrate. I miss the solemnity of the church main hall and yet I am happy that the kids are with me and they know that Friday is for church, praying and talking to God. He is a forgiving God and I’m sure he understands. Great post, thanks for sharing this. Thank you so much for your supportive comment and reminder that even through family, we are getting closer to God. He is forgiving indeed. Thanks for reading! ? Zeyna, this is also something I struggle with. I’m not as regular in prayers as probably you are, and I feel guilty that I focus too much on my parental duties and not enough on prayers. I guess it is a very common guilt factor then, but as a commenter below reminded me, our acts as mothers are also considered worship Alhumdulillah! Hopefully, as the little ones get older, we will regain that balance between mothering and prayer. You totally got me reminded of our Umrah trip back in 2012 when my son was 1.5 years old. Honestly, we didn’t plan as much as you did and alhamdhulillah, you were smart in doing so. As Muslimah mommies it becomes very difficult to focus on our salah and do many more ibadahs as we used to do earlier. However, we can earn as many ajr as possible by simply turning our intentions right. That way, every little thing we do as mommies become an act of worship so easily! Hello Faiza, Thank you so much for your supportive comment and reminder that our acts as mothers are also ibadah in themselves! We tend to forget that very easily, going about our day to day lives, so thank you for the reminder!